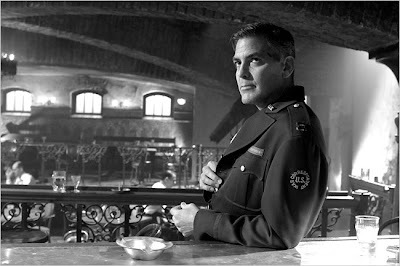 From the opening nostalgic Warner Brothers logo filmed with black and white photography in a square shaped aspect ratio with 1940’s period lenses, The Good German appears at first glance to be a film shot in 1945. We remain dazzled by the studio sets and lack of microphones highlighting the mannered and old fashioned portrayals of the leading characters, that transport us back in time until Steven Soderbergh jolts us from our deception with the inclusion of certain actions that wouldn’t have gotten past the strict production code of the 40's. Highly stylized and filled with literary narrations of multiple characters, this quite complicated film is confusing enough that it helps to watch along with someone else and with the aid of a DVD remote for rewinding, but in the hands of a master like Soderbergh, Paul Attanasio’s adaptation of Joseph Kanon’s novel will remind film buffs instantly of Casablanca, The Third Man, Chinatown and numerous other movies of Hollywood's Golden Age. When journalist for The New Republic Captatin Jack Geisman (George Clooney) arrives in postwar Berlin to cover the Potsdam Conference, he soon finds the political proceedings taking a backseat when he finds himself preoccupied with a murder investigation after the death of his driver (Tobey Maguire) and involvement of his former married mistress now forced into wartime prostitution, Cate Blanchett. As Lena Brandt, Blanchett proves her chameleon-like ability to disappear into any role and she is stunning-- an actress who seems made to be in films of the 1940’s (it’s a shame we couldn’t see her in a battle of wits and skill opposite actors like Gary Cooper or Cary Grant in their prime)—in a performance that according to IMDB, she modeled after the work of Ingrid Bergman and Marlene Dietrich. Although it’s a bit hard to follow at times and film buffs find themselves suffering from sensory overload by guessing which film Soderbergh and Co. are paying homage to at any given moment, it’s still an exciting offering, however, I would’ve liked to have seen more back story or more careful editing in places to aid in some of the needless confusion. It’s a shame that more were unaware of the film’s release—to which I blame the title as the culprit as The Good German is not really one that will grab anyone’s attention (and after viewing the work in its entirety, I have no idea who the title character is without making an allowance for extreme irony) and Soderbergh's opus had the misfortune of being released during the height of awards season around the same time as Robert De Niro’s similar titled epic The Good Shepherd.